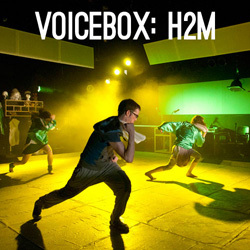 Voicebox is a quarterly workshop series for ensemble performing artists led by innovators and elders from the local and national performance community. 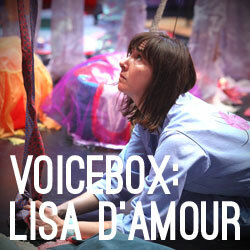 NEW NOISE is thrilled to announce Voicebox: Lisa D’Amour, the latest in our quarterly workshop series for ensemble performing artists! This writing workshop will be led by Lisa D’Amour, Pulitzer Prize-nominated playwright and co-artistic director of Obie Award-winning PearlD’Amour. We hope you’ll join us for a great, challenging weekend exploring the bridges and boundaries between the inner and outer worlds of characters on the edge! General questions? Email phil@newnoise.org or call 504 252 5116. This workshop will focus on character, self-expression and the often-permeable boundary between a character’s internal and external landscape. When does the inside reflect the outside and vice versa? When a character’s desire is big enough, every kind of boundary seems to break down / go haywire – between self and other, between one country and another country, between public and private space (think Stanley and his famous, seemingly eternal cry). Over the course of two sessions, we will read and write and think together and explore how we can manipulate (yes manipulate) both landscape and desire to great theatrical effect. Lisa will assign a chapter from Gaston Bachelard’s The Poetics of Space before the class – feel free to read the whole thing if you prefer. Voicebox is supported in part by the Foundation for Entertainment, Development, and Education, Inc. Thank you FEDE! Angelle Hebert—choreographer, movement artist, and Co-Artistic Director of tEEth—taught Whole Body Screaming, an intensive that moved through a series of guided improvisational exercises exploring expression and connectivity of the body and voice. As in tEEth’s choreographic practice, participants utilized video documentation as a compositional tool throughout the weekend. Founded in Portland, OR, tEEth is an award-winning, nationally-touring contemporary dance/performance art company that merges technical virtuosity with raw visceral impact. Brad Krumholz, co-founder of North American Cultural Laboratory came to New Orleans in April 2013 for a deep, immersive workshop built around the early letters of William Faulkner. Participants memorized a letter from the collection Thinking of Home and brought a song that reminded them of family. These elements were combined with a physical score over the course of the weekend to delve into layers of meaning and association. 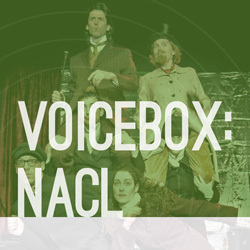 Located in Highland Lake, NY, NACL has been creating innovative, original ensemble theater for more than 15 years. Jay Ruby, artistic director of San Francisco’s Carpetbag Brigade, joined us for a two-day, 16-hour intensive, called The Voice in Action, focusing on the use of voice and song for theatrical composition. 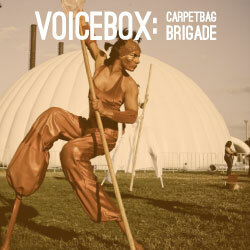 Carpetbag Brigade has collaborated and toured nationally and internationally, with their unique brand of visually-stunning, acrobatic stilt performance. In late winter 2012, Jonathon Walters, artistic director of Portland’s Hand2Mouth Theatre, returned after their smash success in the Fringe Festival to lead a weekend-long intensive in their company process. In the summer of 2011, we presented Voicebox: Pig Iron with Quinn Bauriedel of Philadelphia’s esteemed Pig Iron Ensemble. 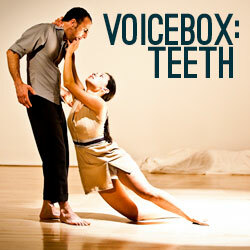 The workshop was part of Voicebox / Sound Off!, a weekend-long celebration of original performance.